The evolution of a deal from your first encounter with someone - using our echo system for Nearby, Closr and Closr Dashboard. The Nearby app is the perfect companion when meeting people. On the street, at the office or at an event. It doesn't matter. You always have your phone in your pocket ready to connect. All you need is an e-mail address. Also add optional location and a quick note to get more context. The important thing here is that you don't automatically request or give out access to any social network when connecting. The only information you give out is what you have put on your digital business card. Like in the "old days". 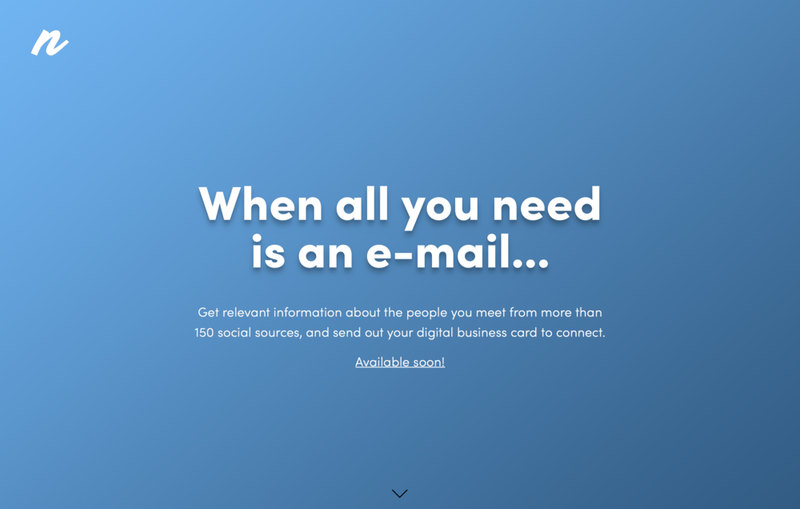 Your new connection will be sent an introduction e-mail with your details and attached vCard, and you will get a reminder e-mail about the encounter you just had containing a vCard with the information you added + other useful public information from 150+ social sources that Nearby instantly finds for you. The Closr app let you add information such as notes, voice memos, photos, meetings and encounters to all the contacts on your phone. 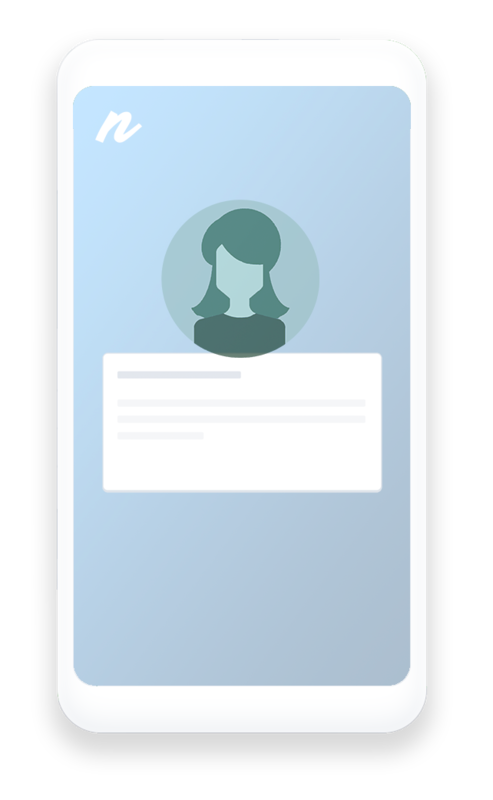 The app automatically creates a last met contacts list for quick access and notes, and a chronological relationship timeline on every contact with where you met, what you talked about and other important information you add. It works in the background and scans your calendar for meetings with your contacts and adds some well needed context 15 minutes before every meeting so you can easily pick up where you left. With every professional relation you have, nicely visible on a relationship timeline with neat reminders exactly when you need them, you're gonna start closing deals like never before! Ready to multiply the number of deals by introducing your whole team to Nearby and Closr? Sign up your team at https://dashboard.closr.io and invite your colleagues to some sales gamification! Set weekly goals for calls, meetings, encounters and other sales activities and watch your team excel while getting rewarded with badges and trophies on the Closr Dashboard. Get automated coaching and follow-ups through push, mail and even through Slack to visualize your awards throughout the organisation. Closr Dashboard is a gamification compliment to any CRM system on the market. It taps in to the actions you initiate from your smartphone, and integrates with the calendar to automatically report the meetings you attend. As stated above, Closr Dashboard works seamlessly beside any CRM system out there since it jacks in to your smartphone through the Closr app. But if you are a smaller organisation, or haven't invested in a CRM yet - we can help you all the way. You can track deals through Opportunity > Negotiation > Proposal > Win/Loss under DEALS in Closr Dashboard. It's an easy to use, light version of a sales tool and together with all the relationship features of Closr, it's really all you need! Hope you find this easy 4-step guide about how a deal evolves through Nearby and Closr interesting. Nearby and Closr apps are free, and the plan for Closr Dashboard starts at $20 per team member and month with a 30 day free trial. Now, improve your relations and close more deals! Since 2015 when we started Cloapp, we’ve always had the vision of helping people to remember important things, connected to the people they meet. It can be simple things like name and age of someone’s child, favorite football team or an old story from growing up together. But of course also things associated with business. This is what drove us to launch the Closr app back then, and this is still our main drive. The Closr Dashboard (Closr for Business) is an extension of this, and more - for companies and teams. We believe working with sales should be engaging, fun and rewarding. Since we couldn't find anything delivering on that, we created Closr Dashboard. It’s based on our own gamification platform and includes automated sales coaching through push, mail and even through third party such as Slack. 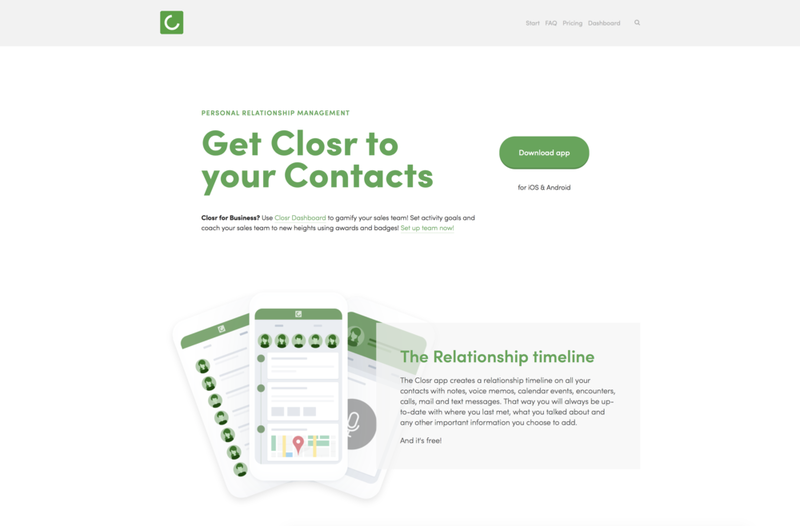 The Closr app will always help you to remember those specific things about people you meet and keep a relationship timeline of all your interactions with that person. For yourself. Used together in a team with Closr Dashboard, it’s also about team activity, goals and awards. Our new website (www.closr.io, launched last week) shifts the focus back to where we came from, but at the same time emphasizes all the good we can do for you as a company when using the app together with our beautiful dashboard. Read more about what we have accomplished since 2015 on our new website. Download the app for personal use (free) or sign up your company/sales team for a 30 days trial. Today we launched Deals in Closr Dashboard. With Closr Dashboard you can now also track your deals through a sales pipe with; 1. Opportunity - 2. Negotiation - 3. Proposal - 4. Win/Lost. It shows current team velocity on sent proposals and wins, and highlights weekly winners and your team average win ratio. Used together with the gamification features of Closr Dashboard this really completes the service for small and medium sized companies with mobile sales people. Closr listed as an interesting Personal CRM app by Ryze.